Welcome to The Holiday Lane pillow blog hop. 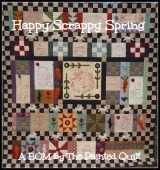 Thank you to Pauline Francis for being such a lovely hostess and keeping everyone organized, to Jill Findley for the lovely pattern and to Madame Samm for creating such interesting programs to keep us sewers constantly in creative mode. I could not resist this delightful cookie jar today when I spotted him in the gift shop. Villages were on my mind and the gingerbread house could happily live on Holiday Lane. Holiday Lane could easily become a table runner. I loved the way the flange was stitched. This was a new technique for me to learn. Grab a cuppa and enjoy all the other pillows on the hop. Oh the trees in the background are great, I never would have thought of that. Very pretty pillow. Your background fabric was a perfect choice for your lovely pillow! Thank you for sharing. Great idea with the background. Love your pillow, it is so festive. And yes would actually make a great tablerunner! Thanks for the hint! Oh its lovely - I love the fabric you have used for the background it works very well! oh isn't that great with the tree fabric as the background, that works so well. I love your new snowman, he's adorable. Its very cute. Nice colours you used. Its also looking nice on a table runner. Great pillow and I love your background, too. Terrific pillow and I especially love the back ground. It really makes the pillow pop!! Very pretty pillow! The background fabric you chose is perfect! What cool fabrics. Brick and morter buildings are what came to mind. I love finding fabrics like that! Fun little guys peeking out doors too!! What a winner! What a great idea for background fabric, makes the scene come alive! Your pillow is my favorite from today! AWESOME! WOW, perfect background fabric!!! Awesome job! I have to agree, the background fabric is amazing! What great fabric choices you made for everything! Nicely done! Fab choice for background fabric and I like all the little extras (embellishments?) you've added - looks like you had fun making it. It is so cute! I love the cookie jar and tea pot. Love the background fabric that you used. Your pillow is wonderful! Happy Holidays! I LOVE what you did with this little pattern. The background makes it look even more like a village. Very cute! I also loved your choice of background fabric! Such a cute cushion, and love the cookie jar too! Your pillow is AWESOME! Thanks for sharing! Really like the fabric that you used for the background. Great job! I do love the idea of making it into a table runner!! Great idea! Great cushion!! and I agree it would make a great runner! OH MY GOODNESS! That tree fabric as a background is MAGICAL! I LOVE the pillow! Simply beautiful- congrats on being in the top three! There's so much detail and character to this pillow--I love it! I was new to making a flange, too, and plan to do it again. Wonderful pillow and I love your cookie jar, too! Congrats on being in the top three... way to sew! I love your sweet village in the woods! It is super cute, and also your cookie jar is a sweety! LOVE, LOVE... beautiful detail and such a clever background fabric!!! What a fantastic choice of background fabric! Love the snow and trees! Thank you so much for joining the hop and sharing your creativity with us. I love the background, it looks like the mountains in the back. Thank you for sharing. Very cute. Your background fabric worked out very well. Great Job! What a wonderful pillow! I love the background fabric and all of your embellishments, especially the mailbox. Oh yes, I love yours. I agree yours should be in the top 3! That mailbox is adorable! Congrats on making the top 3! 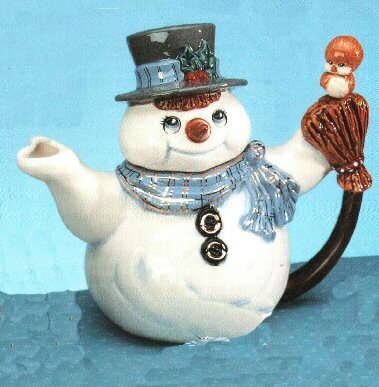 Mr. Snowman fits right into your pillow village. Great idea to use that particular fabric for the background; who says it can't be daytime; very creative. That fabric sure reminds me of some of my fondest memories. We used to tramp hills that looked like that when we hunted for and cut our own cedar trees in the Little Switzerland of Northeast Iowa! Your pillow is so pretty...love your choice of fabrics!! Thanks for sharing! Oh the background fabric you used is just perfect for a snowny village! How wonderful! I absolutely love your color choice! so warm and homey! Wonderful job Frances , love the background fabric ! Great post, and that's a great pillow! Gorgeous pillow - the background fabric was such a perfect choice! Beautiful pillow and congrats on making it in the top three! Thanks for sharing. What a beautiful pillow and your background fabric is so darn cute! Congrats! What a cute pillow!! The details you added were outstanding. I loved the mailbox!!! Mdm Samm picked a good one here! This is always so much fun hopping around to see everyone's creations. I love your "background" fabric of the snow covered hill! Great job! sweet! your background fabric is perfect. I love everything about your pillow. The background fabric is perfect for a Christmas village. Wow.It`s just beautiful and the background fabrics is fantastic.Thanks for sharing! Your pillow is adorable! I covet your snowman teapot...your cookie jar goes very well with both! What a great background fabric you chose...gives a whole new dimension to this project! Loved your pillow, everyone is so different and interesting. Thanks for sharing. Love the background fabric on your pillow and all the things you added on! Great project...thanks for sharing! How cute is this! Your little parkette flows right into the "background" fabric. Love it. I wanna come over and have tea and cookies, served from your festive crockery! I love your pillow!! It turned out wonderfully!!! What a cute choice of background fabric. Thanks for sharing. How lovely! Love the extra details you added and that great background fabric. Loved the tree back ground fabric!! Love, love, love your pillow! What great background fabric! See you on November 26th...and have a wonderful Thanksgiving! absoutely fantastic, I love your cushion! Thanks for sharing your wonderful pillow! your cushion is fab - so detailed! I love the fabric you chose for your background - what a great pillow! I would not have been able to passed by the cookie jar either. You are right, the pattern for the pillos ould make a great table-runner. Really liked your background and Cookie Jar. Hi!!! Very pretty and I love the cookie jar too!! !